Two bedrooms, two king size beds, Jacuzzi for two, shower with steam, in-room safe, computer with Internet, kitchen with cooktop, microwave and fridge,washer and dryer, 3 LCD TVs with Satellite channels. Did you know that Odessa was part of the Ottoman Empire until Turks were defeated by Russians in 1792? There are many reminders of the Turkish times in Odessa, and this influence provides the inspiration for decorating the Emily Apartment. Everything in the Emily Apartment is there to make a weary traveler feel welcome and pampered: two exquisitely decorated bedrooms with soft, luxurious fabrics, super modern bathroom with large Jacuzzi bath, steam shower, and fully equipped kitchen with stove, fridge and microwave oven. The oriental influence is subtle and mostly in the details: soft earthy color palette, ornate light fixtures, low bed in one of the bedrooms, the scone-shaped bar stool in the living room bar. All the modern facilities are there as well: flat screen TV with large number of international channels, computer with wireless internet, air conditioning, wall safe and the secure lock at the entrance door. The kitchen has dining space for six and a counter that can serve as a bar, with a few bar stools. The combination of oriental and modern is extremely tasteful and well executed, to create the atmosphere of luxury and opulence. And that is what tired traveler expects after spending a day sightseeing or working on a deal with one of many modern Odessa companies. 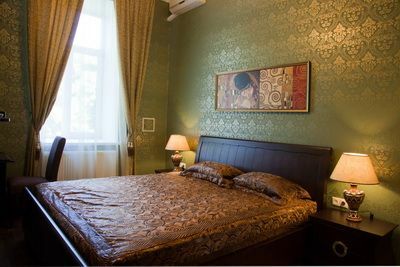 Emily Apartment is a perfect retreat for a day or a home for a few years, if your career brings you to Odessa. It is located in the center of Odessa, in the City Garden area, steps from the pedestrian trendy Deribasovskaya Street with its shops, bars and restaurants. It is a perfect spot to start exploring beautiful Odessa from and to enjoy all that this modern city has to offer. $90 per night if you book for 6 nights or more.